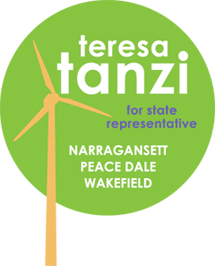 NARRAGANSETT - On a Primary Day that saw several upsets, none was more shocking than newcomer Teresa Tanzi's victory over House Judiciary Committee Chairman David Caprio of Narragansett. The rookie politician trumped incumbent Caprio Tuesday night in the District 34 Democratic primary, ending his 11-year reign in Narragansett and South Kingstown. At South Kingstown High School, Tanzi captured 72.4 percent of the votes, finishing with 307. Caprio received 117 votes, or 27.6 percent. Results were closer at the Forest Fire Station on Holley Street, with Tanzi receiving 235 votes and Caprio receiving 132. Both candidates spent Tuesday afternoon and evening at the community center on Mumford Road looking to garner votes as the clock ticked toward 9 p.m.
"What it comes down to, we had a broad base of support," Tanzi said immediately after learning of her victory at Kabuki restaurant in Wakefield, where she celebrated with dozens of friends and family, including her 4-year-old daughter, Delia. 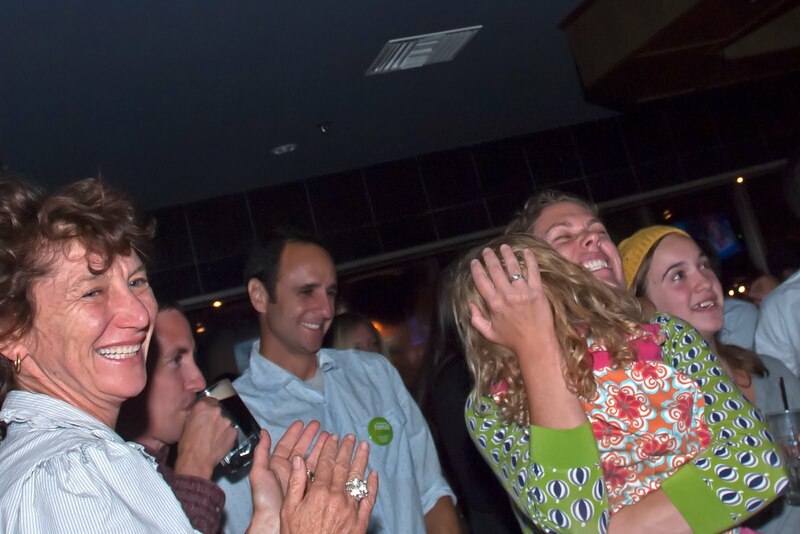 Her followers erupted the moment results came in, adding to an already buzzing atmosphere. "We did this from the ground up, and what spurred us on is just the day-to-day support of people who said, 'Thank you for bringing up the issues,' " Tanzi said. Caprio waited at the community center for results to come in and called to congratulate Tanzi almost immediately after results were tallied. "It was an absolute honor to serve the people of South County," he said. "I wish Teresa well in representing our people in the State House." Tanzi thanked her campaign manager, Libby Kimzey, and residents of the district. "This has been such a broad campaign, with so much support throughout the entire community," she said. Caprio was elected in 1999 to fill the unexpired term of James Kelso after his death, in what was then House District 47. As Tanzi's campaign evolved, it became clear that she would present Caprio's stiffest challenge since defeating Democrat George Lenihan Jr. in a primary in 2002. In 2000, 2004 and 2006 Caprio ran unopposed, and in the last election, he handily defeated University of Rhode Island student Ryan Drugan with 70 percent of the vote. Tanzi, who ran an organized, grassroots campaign that featured a strong community presence, started door-to-door visits early and sent out personal letters and postcards. Caprio quickly rose to the challenge, sending out mass mailings as well as a personal letter to his constituents. Tanzi ran on a platform that included ideas for local energy, local food and the local economy. Recently, she voiced opposition to tax reform passed by the General Assembly. She said she looks forward to revitalizing the district. "It has been, from the beginning, about the health of our community," she said Tuesday. An intriguing subplot to this race developed as both candidates emphasized their roots in the community. Caprio was raised in Narragansett and attended elementary and junior high school here, but the Tanzi camp suggested his alliances lie in Providence. Caprio dismissed the remarks, saying his law practice and duties at the State House dictate where he spends much of his time. In a letter to constituents, he referred to "special interests [that] have descended upon us from 'North of the Tower' to support my opponent" and suggested that Tanzi had run a negative campaign. His supporters have said Tanzi was recruited by union interests upset about Caprio's vote on changes to teacher pensions. With turnout much higher than it was in 2008, the mood of discontent among voters may have played a large role in Caprio's defeat. In 2008, total votes for the same primary race totaled 1,623. This year, the number jumped to 2,308. On Tuesday, both were visible while chatting with voters outside of polling places. Caprio stayed at the community center, which was the busiest of the precincts, serving hamburgers and hot dogs. Tanzi was mobile, bouncing among the three precincts after casting her vote at around 10 a.m. At the Forest Fire Station polling place in Wakefield, she served campaign cupcakes baked by Sweet Cakes Bakery in Peace Dale. "We've had fun throughout this entire campaign," she told her supporters Tuesday night. "It's been such a rewarding experience through the get-go." At the polls, Caprio was joined by friends and family, including his gubernatorial candidate brother, Frank T. Caprio, and his father, Providence Judge Frank Caprio. U.S. Rep. James R. Langevin, who won his Democratic primary contest in the Second Congressional District over Elizabeth Dennigan and Ernest Greco, also was spotted at the community center. Tanzi will face Timothy W. Burchett, a Republican, and Peter J. Stone, who is running as an independent, in the Nov. 2 election.